A2 is a Czech cultural biweekly, which reflects culture in the broad sense of the word, including articles on social events and politics. Published every second Wednesday, it offers 32 pages on literature, film, art, theatre, music and, of course, politics and social issues. A2 was established in October 2005 and published as a weekly until December 2008. The publication strives to approach quality living art in context – be it in the context of other artistic categories, the context of civil society or the context of both Czech and international art production. A2 seeks works and tendencies, which present a true picture of our time, frequently providing us with a more sensitive, accurate, provocative and even more unsettling impression than that which we would necessarily wish to obtain. 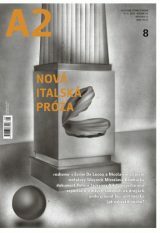 A2 has often been the first publication to introduce new topics to the Czech milieu, including new terms such as ‘precariat’ and ‘NIMBY’ and inspirational thinkers and artists like Slavoj Zizek and Giorgio Agamben. The publication also endeavours to ensure that serious “academic” topics (for example, contemporary literary theory, documentary film, Austrian literature on migration, video art etc.) are discussed in such a way, as to remain comprehensible and appealing to the readership. A2 is financially supported by the Ministry of Culture of the Czech Republic and the International Visegrad Fund.